I received this picture from my friend. She wrote to me: “I don’t really understand this picture. You can introduce the man in the same way”. Of course you can. But it’s never done. And I’m not saying about some birthday party, where you introduce some new person into the group of friends saying: “This is Fred, he is Katie’s boyfriend” or “this is Matt, he is Anna’s big brother”. This situations happen and it’s natural to mention the affiliation of somebody newly met. 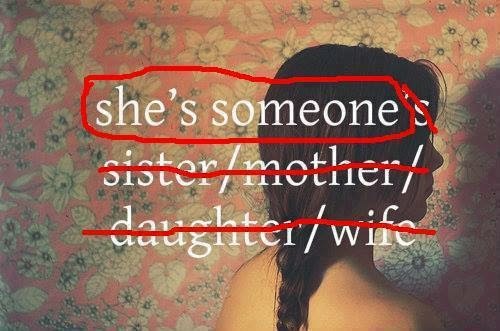 And in that case everybody is somebody’s sister, brother, mother, father, grandma, uncle, friend, girlfriend, etc. But what this picture is implying is that in the outside world woman is not perceived in her own autonomy and through the lens of her own achievements. She might be successful, but she will always belong to somebody. There are two women that automatically came to mind when I saw this picture: Rona Fairhead and Amal Alamuddin. Rona Fairhead is a highly achieving business woman, with lots to offer. She is the former CEO of the Financial Times Group and a former non-executive director at HSBC. And she was on the path to yet another success: becoming the first woman in charge of overseeing the BBC. Being the person that Rona is, it shouldn’t be difficult to write an appropriate headline to announce that she is a probable choice for this position. Some of them were, but not all. For example, The Telegraph, for which they were later on slammed. “Mother of three poised to lead BBC” was written loud and clear. We can argue many things in this instance: that it was just one incident, that Telegraph might be biased at a time, that it’s not a big deal… But it did happen and it is a big deal. Tell me, how her motherhood has anything to do with her credentials to do this job? She could have a small kindergarten with adjacent zoo for all I care and it still shouldn’t matter whether she is cut up for this job or not. And most important thing: this is a headline that we have never seen describing a man. Second person, Amal Alamuddin. Amazing woman, accomplished international and human rights lawyer. She hold a degree from Oxford University where she won Shrigley Award and she has LLM degree from New York University (plus Jack J. Katz Memorial Award for excellence in entertainment law). She represented clients in cases before the International Criminal Court, the International Court of Justice and the European Court of Human Rights, etc. So pretty much she rocks! But she got engaged. And she got engaged to a famous person – George Clooney. The headline of The Telegraph: “George Clooney engaged to ‘utterly beautiful’ British lawyer”! Rushing to explain: “The Hollywood star's engagement to glamorous human rights lawyer Amal Alamuddin is warmly welcomed by friends and work colleagues”. And it’s not the point that she is not pretty, because she is. But at this point of her career with such achievements, it shouldn’t be the first thing that is mentioned. But that’s what the entire article is about: how hot she is. But it’s get more interesting (read: worse). Amal Alamuddin was offered a position in UN’s three-member commission of inquiry looking into possible violations of international criminal law. And yet again, she was offered this job because of her successes, not her hotness and fiancé. But apparently the most important information is that she was engaged to George Clooney. Oh, come on! It’s George Clooney! It’s pretty big deal, right? The Guardian was all over this and just didn’t seem to know the difference between crucial information and not-that-relevant-to-the-case information. 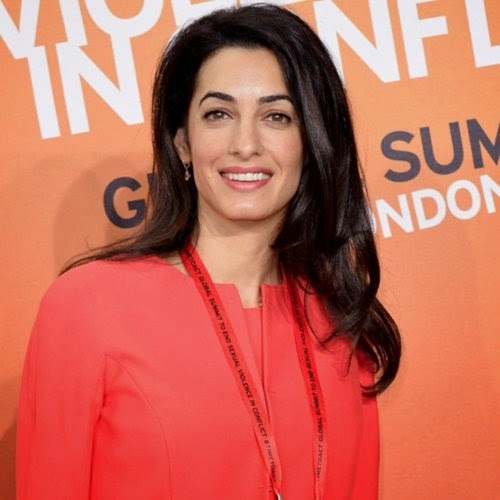 First there was “Amal Almuddin, George Clooney’s fiancée, toserve on UN Gaza inquiry”. If it wasn’t enough, the information had to be restated: “British Lebanese lawyer Amal Alamuddin, who is engaged to George Clooney, has been chosen...”. Then there is some mentioning about her achievements (I’m not even sure whether those are even correct or not). Is this discrepancy caused by lack of famous partner? Because for me it seems that The Guardian make its best effort to minimalize Amal’s life’s work and bring it down to her being “hot and engaged to someone famous”. At the end of a day, Amal’s engagement was a problem. There has been voices saying that the choice of Amal for the commission is an attempt to bring more attention to the cause by involving Hollywood and the future-to-be husband, George Clooney. On the other hand, William Schabas is a known critic of Israel, which also brought controversy. But somehow news of him being in the commission brought another types of headlines: “Known Israel critic to lead UNHRC Gaza probe” or “Baird’s criticism of Canadian international lawyer and UN investigation of Gaza a sign of the times” or “Jonathan Kay: William Schabas’ casual anti-Israeli bias makes him a perfect fit for a UN ‘fact-finding’ inquiry”. All of them more descriptive, more about him and his views, but also acknowledging who he is and what are his credentials. The New York Daily News: “Amal Alamuddin, George Clooney’s fiancée, turns down spot on UN war crimes panel on Gaza” (New York Daily News). If it’s not enough to convince you, Daily Life published very interested article on how sexism treated Amal throughout that time. I could go on forever on this issue and find plenty more examples of how media can bring down any woman’s achievement by highlighting her affiliation and belonging. But let’s stop here. I’ll just mention again, that this is how men have never been treated by media. It was never relevant whether he is a father of five, uncle of actress or husband to some eligible girl. Somehow, we haven’t seen headlines such as: “Amal Alamuddin engaged to deliciously hot actor” or “George Clooney, fiancé of human rights lawyer Amal Alamuddin, will star in…”. Because when a man achieves a success, he owns it. If woman achieves the success – there is always a question of who she is outside of that success. So no, she is not somebody’s mother, sister or wife. She is somebody, somebody with aspiration, ambitions, talents, achievements. 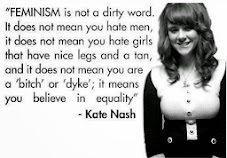 And it’s bloody time we start perceive women from the perspective of themselves, not others.